Amazon has come up with Amazon advertising. Steps involved before your consumer makes a purchase define if he will press on the buy button. Also, this is where you have to bring yourself to the attention of the customer. 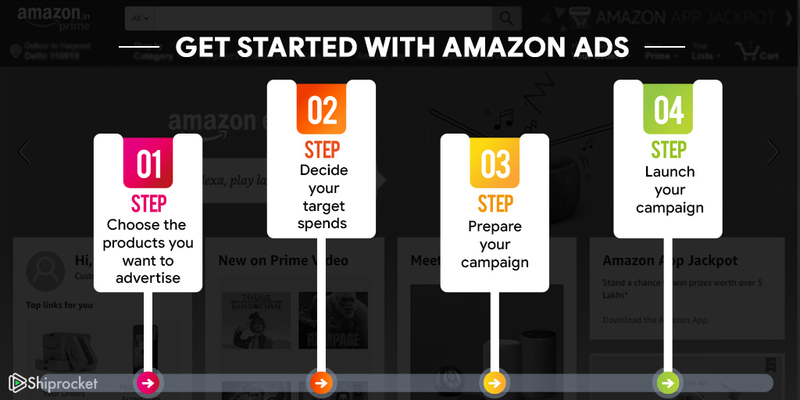 For making a better impact, here is your guide to Amazon advertising! Amazon advertising is your key to publicizing your product with Amazon. These are found within the Amazon search engine and the product pages when someone searches for products on Amazon. Third party sellers can maximize their reach using these paid advertisements and reach out to a vast audience on Amazon. These are the advertisements you see when you look for a product. For example, if you search for ‘A4 paper’ on Amazon, the first two listings you see with the name ‘sponsored’ are sponsored products. All sellers, brands, and agencies are eligible for sponsored ads. Your products must be unique, new, in one or more categories, and qualified for Amazon buy box. Amazon buy box is the white box found on the right side of your product listing which contains the ‘add to cart’ button. Not all sellers are eligible for the buy box. Amazon has a strict algorithm for choosing products for the buy box. Thus, you must have a professional seller account, a buy box eligibility status (can be checked on your seller central account), a unique product and the product must be available in the inventory. Just like sponsored products, sponsored brands are ads which display your brand logo and display upto three of your products. For example, if I search for televisions and the first listing I see with the ‘sponsored brand’ tag are these ads. All sellers with brand registry, brands, and agencies can sign up for sponsored brands advertisements. You can set up your multi-page store with Amazon where you can showcase your products and write about your brand. This option is not exactly a part of their advertising program as you are not charged for it. Creating a store is free, and you can do it if you are selling products on Amazon. You must be a professional seller with brand registry, a brand or an agency to be eligible to create a store. 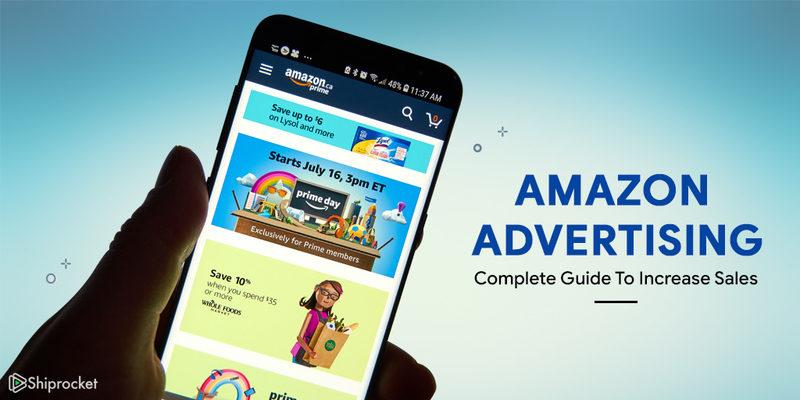 These are the advertisements which appear as banners when you search for a product, on Amazon’s home page and mobile apps. You don’t need to sell on Amazon to advertise your brand and products using display ads on their website; you can link product pages, stores and external site links to your display image. Also, you have the liberty to design your creatives, and if that option doesn’t work for you, you can also ask Amazon to create them for you. There are audio-visual advertisements which run on Amazon web and mobile sites. Just like display advertisements, these ads do not require you to sell on Amazon. You can link them to any product page, store, landing page or external site link. How does Amazon Charge You For Ads? For most of their ad campaigns, Amazon charges you on a PPC basis. PPC stands for pay-per-click where you only pay when a customer clicks on your ad. You set up your ad around some keywords on which you bid a desired target price. According to the bids placed on these keywords, the amount of each click is decided. Therefore, the PPC can vary widely as it ultimately depends upon the number of people bidding on a keyword. Amazon PPC works for sponsored products and sponsored brands. For display campaigns, you charged on a CPM or cost per thousand impressions basis where you pay for every 1000 people who see your ad. Prices for display ads can vary based on format and placement. The more you bid on keywords, the more the chances of your ad being displayed first on Amazon’s search engine results page, product searches, and product pages. The costs of your ad are deducted directly from your seller account balance. Therefore, in a way they are deducted from your selling price once the sale has been made. Just like fees are deducted in Amazon easy ship. How to Get Started With Amazon Ads? Getting started with Amazon ads is extremely easy. All you need to do is choose the products you want to advertise, decide how much you are willing to spend and finally launch your campaign. Campaigns usually go live after one hour of creation. Why opt for Amazon Advertising? As Amazon is no less than a search engine, ads can help you boost your store’s presence. With the significant audience searching with an intent to make a purchase, you can leverage a vast base of people to view and purchase your product. With sponsored ads and brands, your product is visible to everyone who searches for the product in that category. Therefore, investing in ads can improve your products visibility and make it available to a broad audience much faster and thus help make more sales. With increased visibility among a large audience, you are bound to increase sales. Investing in sponsored products, brands, display ads, and video ads can give you the platform for rising clicks and improving sales. Once the user lands to your product page, you can push them towards a purchase with an optimized product listing. As you can set up your store with various pages, the brand awareness of your product increases. You can explain your brand story creatively, write about your products, and display more products on your store. With an Amazon store, you get your URL which you can add to display campaigns and video advertisements. This way you land more users on your store and generate higher chances to make sales. Amazon ads are a step ahead in the eCommerce game. Start with them to make sure you can reach out to a vast audience and sell your items more aggressively!